FLIPBACK: Are You Read For A New Kind Of Book? Are you ready for a new kind of book? This September, six new bestselling titles are to be given the FLIPBACK® treatment – What I Loved by Siri Hustvedt, Bad Men by John Connolly, Little Face by Sophie Hannah, Mister Pip by Lloyd Jones, The Bone Collector by Jeffery Deaver, Misery by Stephen King and Brethren by Robin Young. See the complete list to find out more. 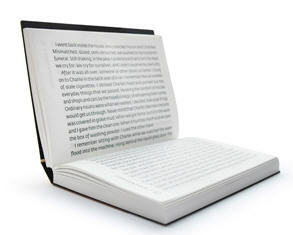 The FLIPBACK® opens top to bottom and has sideways-printed text, providing a full length novel in the size of a smartphone. 1 Comment to FLIPBACK: Are You Read For A New Kind Of Book?